The Sailboat Cruising Journal serves a quite different purpose from the Log Book. Whereas the log book records meteorological and navigational data at regular intervals of time, the journal is a narrative describing pretty much anything that occurs on passage. For most sailboat cruising couples, it normally falls to the first mate (meaning not the skipper) to write the journal - if indeed a journal is kept at all. At least that's how it is on Alacazam. 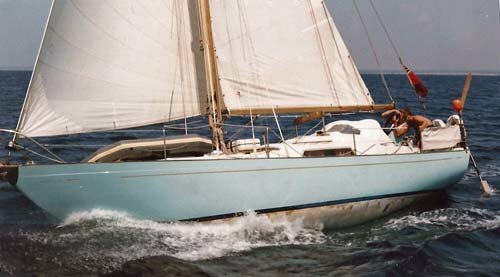 When Mary and I first started sailing together more than 20 years ago on my Nicholson 32 'Jalingo 2' we didn't keep a proper journal, so all we have to stir our distant memories of sailing in the Mediterranean are a few scribbled notes in the log book - 'dolphins on the starboard bow' or 'horrendous marina charges' or the like - together with a few photos. And that's a shame, as a journal can be a very useful aide memoir when trying to recall a snippet of information from the past. Now on our new sailboat 'Alacazam' (as shown at the top of this page) it's rather different, as Mary keeps a detailed 'warts and all' journal for all our cruising escapades. Predictably perhaps, most of the warts are mine. 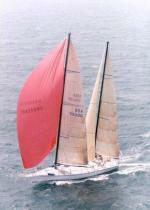 Her journal doesn't just describe events on passage, but also the time spent at anchor and the frequent forays ashore. But apart from placing all my errors, omissions and acts of spectacular misjudgment on permanent record, there's another downside; it takes time. Lot's of it if you go into the detail that Mary does, much of it too trivial - in my opinion - to deserve a journal entry. And that's the whole point - it's Mary's journal, not mine. My opinion doesn't come into it. But sailboat cruising is all about making the time to do the things you want to do, rather than what someone else decides you should. It was my chuckling that alerted Mary. "More smutty jokes from your mates?" she asked, sidling up to look over my shoulder. "Not this time" I said, "Just reading your journal". It wasn't funny when it happened, well not for me anyway. On a particularly frustrating day I'd leapt barefoot into the dinghy, only to step on a bee - which promptly did what bees do best, right between the toes. I'd forgotten the incident, but there it was. "I've got an idea" I said, "Why don't I put some of your journal stuff on Sailboat Cruising.com?" "Not just some of it" said Mary, "All of it, or nothing". So here it is, Mary's 'warts and all' view (most of the warts, I notice, appear to be mine) of our new life afloat as we made our way from the UK to the West Indies in our sailboat Alacazam. If you like the journal so far, why not subscribe to RSS (top left of this page and down a bit) for notification of the next chapter issue?